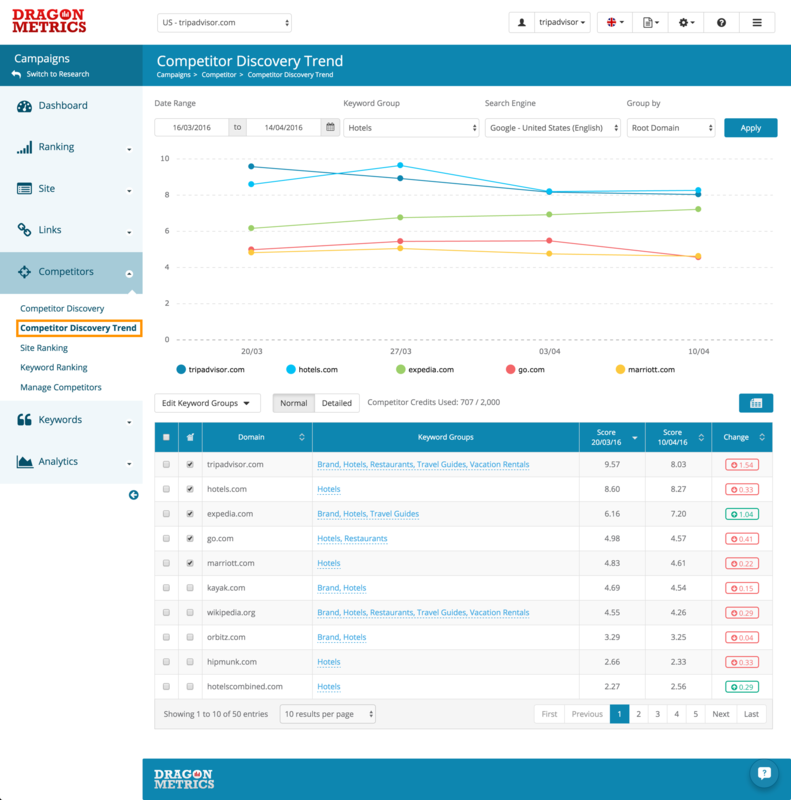 Competitor Discovery Trend automatically get your site's top competitors for your target keywords, and measure their competitiveness over time, with this tool you will be able to quickly spot emerging competitors and changing of your competitive landscape very quickly. At the top of the page, you can see the Keyword Group selector, Search Engine selector, group by root domain or sub domain selector and competitor discovery's last update date. Date Range selector - With the Date Range selector you will be able to view competitors trend in your specified timeframe, please keep in mind that since our competitor discovery data is updated weekly, the smallest interval for this page to show data from one day to another will be weekly, so for example if you choose 1/4/2016 - 6/4/2016 which is a 6 days interval, but only data from one of these days will be shown, so to compare data between different days you will need to choose an interval of at least from 1/4/2016 - 14/4/2016. Search Engine - Keyword Group in Dragon Metrics can contain one or more tracked search engines and with the Search Engine selector you'll be able to get a different set of competitors in different search engines you've been tracking in the keyword group. Group by Root Domain or Subdomain - Search engines consider different subdomains as individual domains and will rank them independently, to see which competitors' subdomains you are competing with, you can use this selector. After you've selected the data you want to view with these selectors, click Apply and the page will be refreshed with a list of competitors within your selected criteria. Below the selectors you will see a trend chart showing you visibility scores of up to 10 competitors you've selected to display (more on that later) over time. Visibility scores are calculated based on ranking performance of the domain across keywords in the keyword group, the higher and the more keywords the competitor is ranking for the higher the score the domain will get, hover over each bars in the chart will show you the exact score for that domain. 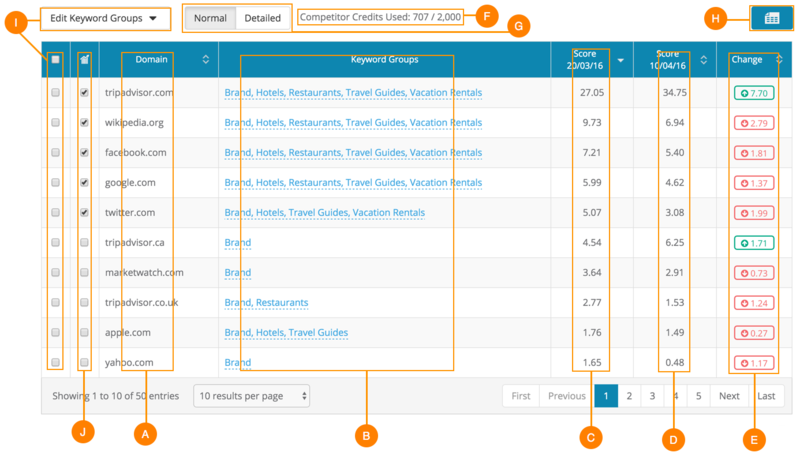 J - Use the check boxes in the second column of the table to choose which competitors you'd like to show in the Competitor Discovery Trend Chart.